History of Orihuela. 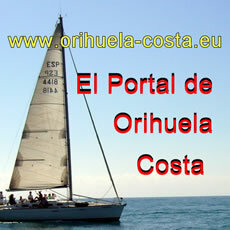 The city of Orihuela is situated south of the province of Alicante. Its 338, 5 km2 of municipal grounds are the second largest of the whole Region of Valencia and include from a series of mountain ranges to coast. 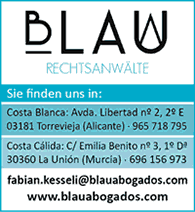 During the last four centuries it has been the "Episcopal City" of the province of Alicante. Orihuela has an important artistic patrimony, resulting from its long and involved history, as well as the notable religious impression on its civic traditions. There are vestiges of human settlements from the second half of 3000 B.C. (Catholic) up to the Iberian and the Roman periods. During the Visigoth period, this city was the capital of the demarcation that included the current provinces of Alicante and Murcia. During the VIII Century it was the head of the Teodomiro Ducat that settled its autonomy with the Arabs. According to the legends, the highest distinction of the Visigoth's positioned women dressed in warriors´ uniforms on the town's forts to force the negotiations with invaders. In the IX Century it lost its independence against the Caliphate of the Omeya´s. Later on, Alfonso from Castile (later known as Alfonso X "The Wise") reconquered the city. The capital of the Vega Baja region of the Alicante province, Orihuela is an ancient town with a long and distinguished history. Though there were settlements in the area during the Bronze Age, Orihuela came into its own during the Roman occupation when it was known as Auraiola, later an important headquarters for the Moors under Teodomiro it was re-conquered for the Christians in 1296. Recognised for its large number of beautiful churches, palaces and monasteries. In 1564 the diocese of Orihuela was created. During the "Succession War", the city's governor, the Duke of Rafael, supported the pretender Charles of Austria; and Phillip V´s victory caused the city's ravage and loss of authority. Orihuela has an extensive artistic patrimony thanks to its long and eventful history. The old part of the town was declared a historic-artistic and monumental area in 1969. There are noble buildings, some of these are declared Cultural Heritage. It was initially built as a parish church and then it became a collegiate church, an archpriest church and, finally in the 16th century, it became a cathedral. 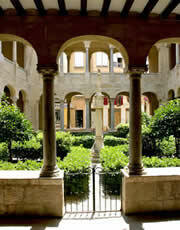 Its construction, which initiated at the end of the 13th century, is Gothic Catalán. It has three main entrances, two of these are from Gothic period (Puerta de las Cadenas and Puerta de Loreto) and the third one is from Renaissance period (Puerta de la Anunciación). In the interior, we can highlight the ornamental iron work, the Baroque organ and 18th century choir. Its construction started in 16th century under the patronage of Mr. Fernando de Loaces. It is a real jewel from the Renaissance period. It was a university from 1610 to 1824. There are two magnificant cloisters, one from renaissance period and the other one from Baroque period; the church is from renaissance period with Baroque decoration added at a later stage. There is also a remarkable entrance to the sacristy, from the Renaissance period. And the Refectory with an interesting socle with Valencian tiles from the 18th century. It became the University Headquarters again 1999. Gothic work, with one Renaissance and the other Baroque facade. Its beautiful square-base Gothic tower, with very interesting gargoyle figures, deserves a special attention. In the interior, we can highlight the front and the organ. An important archaeological finding, located on the slopes of a small hillock. It covers an ample time span between the 9th and 4th century BC. It dates back to the bronze age, lasts through the iron age and it was Iberian at later times. It has great scientific relevance because it was one of the first findings where we could research into the process of Iberian beginnings and appreciate how the natives lived and how these originated the Iberian Culture. The artistic-historic tradition of Orihuela, has brought forth an array of cultural manifestations which can be seen in the town. For this reason, the town is host to several museums, which offer the visitor a great variety of activities to make the most of your stay in Orihuela. This is a museum of the folklore festivals of the Moors and Christians. In this museum, festival tunics belonging to different costumed groups, musical instrument, armamanets, publicity placards announcing the festival, photographs, etc. can be seen. During the years from 1998 to 2000 some important archaeological excavations in the old Patio of the Casa del Paso were carried out. The findings have been spectacular and of great architectural and historical importance. Given the great interest in these discoveries, the basement of the Building "Casa del Paso" on the Salesians´ Campus of the Miguel Hernández University have been preserved and opened for viewing.. The museum displays interesting collections of paintings, sculpture, gold and silver work, clothing, furniture and religious books. Among the paintings, the visitor can contemplate the exceptional religious work of Velazquez "La Tentación de Santo Tomás"(The Temptation of Saint Thomas) stands out. This museum is situated in the Church and Hall of Men in the old Municipal Hospital. We can also contemplate, in the same place, the Comarcal Archaeological Museum with artefacts dating from the Palaeolithic era to the 18th century. The house where the poet lived contains many of his contemporary personal effects and photographs of the writer in various places and situations. This museum houses the majority of processional thrones and sculptures which are paraded during Easter Week in Orihuela. Among these religious, the visitor can appreciate the outstanding artworks such as "El Lavatorio", "San Pedro Arrepentido", "El Ecce Homo"and"Nuestro Padre Jesús de la Caída" by Salzillo stand out.